(Bloomberg) -- Park West, a 3,400-bed student housing complex near the Texas A&M University campus in College Station has a resort-style rooftop pool, three gyms and lounges with billiard tables, ping pong and flat screen televisions. What it doesn’t have are students -- or rather their parents -- willing or able to pay as much as $1,000 a month to live there. Just over half the beds at the complex, financed largely by tax-exempt municipal bonds, were filled during the last academic year. About 360 miles (580 kilometers) north in Norman, Oklahoma, a 1,230-bed residence hall at the University of Oklahoma featuring a "blow dry bar and salon," a market with grass-fed local meats, and a cycling studio is just 26 percent leased, according to a securities filing. It opens in August. “We have seen some projects go through a little bit of stress," said Jessica Matsumori, an analyst at S&P Global Ratings. S&P has rated about 60 privatized municipal student-housing deals, most of them BBB-, the lowest investment grade. As universities tap outsiders to finance a dormitory arms race while keeping debt off the books, the Texas and Oklahoma projects underscore the risks to investors of overbuilding luxury accommodations as students and parents become more cost-conscious. 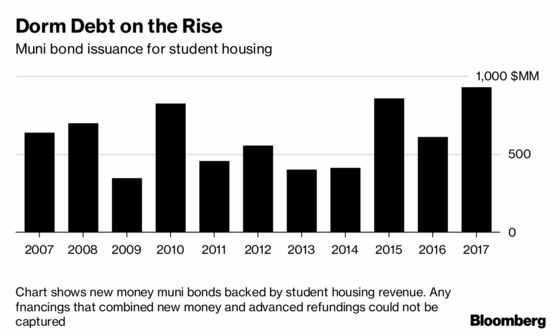 Municipal-bond sales for new student housing projects backed only by rents grew to about $930 million last year, a 45 percent increase from a decade before, according to data compiled by Bloomberg. Unable to pay operating costs and service $360 million of bonds with project revenue, the non-profit owner of the Texas A&M complex, National Campus and Community Development Corporation, agreed May 17 to give bondholders more control over the project. Texas A&M also agreed to advertise the complex on its campus housing website. Last week, S&P downgraded $250 million municipal bonds that financed the University of Oklahoma project to BB. Baton Rouge, Louisiana-based Provident Resources Group, the non-profit that financed the dorm, attributed weak demand to a “lack of creative marketing strategies" and higher rents than other housing, the ratings company said. Greg Eden, a former public finance-lawyer at Kutak Rock and president and sole employee of Austin, Texas-based National Campus, didn’t return calls seeking comment. Steve Hicks, also a former public-finance attorney and the chief executive officer of Provident, said his group will address the the issues related to the S&P downgrade in the coming weeks and that bondholders will get timely updates. National Campus has financed housing at Florida International University and Drake University it Iowa. It has also issued debt for a hotel and conference center at Texas A&M. Provident owns student housing at Kean University and Montclair State University in New Jersey, Towson University in Maryland, and North Carolina State University. The projects are developed and managed by private companies. Few restrictions apply to tax-exempt financings by non-profit entities, said Mark Scott, a former head of the U.S. Internal Revenue Service’s Tax-Exempt Bond Office. “The real question is why an entity that builds luxury apartments is entitled to non-profit status," he said. Park West, which is closer to Texas A&M’s 102,733-seat football stadium than to academic buildings, opened at the flagship school in fall 2017. The 5,200 acre campus, about 90 miles northwest of Houston, has more than 55,000 students and enrollment has grown at an average annual 2.7 percent per year, between 2005 and 2015. A market study that accompanied the 2015 bond offering for Park West said there was ample demand for the project. But Park West only rented 54 percent of beds in the fall semester and 52 percent in the spring, according to S&P. Management told S&P the market study didn’t capture all the new housing supply coming on line in the area surrounding the campus. S&P downgraded the bonds eight levels to CCC in December. Park West competes in a Class-A off-campus student housing market of 25,000 beds that grew an average of nine percent a year between 2014 and 2017, triple the annual enrollment growth at Texas A&M, according a market assessment commissioned by National Campus. More than 2,400 beds are slated for delivery in fall 2018. “The top end of the market remains extremely competitive," according to an evaluation by Meyers Research. Rents declined 3.2 percent in 2017, the firm said. To fill beds, Park West cut rents on many units below $600 a month, according to Meyers. Almost 90 percent of beds are pre-leased for the fall semester, but the revenue shortfall means that the project will need to draw on reserves through 2021 to pay debt service while gradually raising rents. The forbearance agreement gives bondholders, led by Nuveen Asset Management, the right to review and approve budgets and get weekly leasing reports. Bondholders agreed to allow revenue to pay operating costs first and then debt service. John Miller, Nuveen’s co-head of fixed income, declined to comment. Nuveen owns 43 percent of the bonds, according to data compiled by Bloomberg. The Vanguard Group is the second-biggest holder with about 17 percent. Vanguard spokesman Freddy Martino also declined to comment.